Very elegant and attractive chess set which stand on its board. 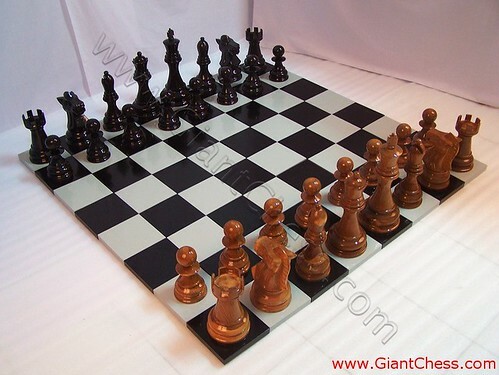 Black and brown chess pieces, carved in high quality product by professional craftsman. Look the board also. The flat board also made carefully by those craftsman and painted in white-black squares. Those are big chess set that very durable for outdoor and indoor use, because it has made of best Teak wood material from Java Island. So you do not need worry about its quality because we choose the best wood that has dried before. We are the manufacturer of chess set. You can choose one of our chess set and we will give you good price. We have chess set in variety sizes and design. We have standard size of chess, big chess and giant chess. We also has some chess models, including; standard design, staunton, decorative and classic. You will have great chess collection if you buy chess set to us, the best and wonderful chess in world.